As of Saturday, the group had blown through at least $95.7 million out of the $118.6 million it had collected by the end of last month, according to Federal Election Commission (FEC) filings. A lot of media sources have scrutinized why Jeb Bush's super PAC money didn't gain his campaign more traction in the early primaries. Right to Rise poured out $34.5 million in January alone, and another $22 million in February, reported The Washington Post on Saturday. Still, the "once upon a time" GOP front-runner's poll numbers didn't budge. But now that it's all over for Jeb's campaign, what's going to happen to the remaining $23 million still left in Jeb Bush's super PAC? Super PACs have only been in existence since 2010 – thanks to the Citizens United v. FEC Supreme Court case. The case opened the doors for political lobbying groups to raise unlimited amounts of cash without having to reveal their donors (so long as the committees don’t directly correspond or associate with the candidates for whom they operate). For instance, former Texas Gov. Rick Perry's super PACs – the "Opportunity and Freedom PAC" and its two subsidiaries, "Opportunity and Freedom" No. 1 and No. 2 – had $13 million left in their coffers when he dropped out. They were all "meant to be heavyweight sluggers for Republican Rick Perry, providing big-budget support for his second presidential bid," reported NPR on Sept. 21, 2015. But even after a month of TV ads following Perry's campaign announcement in July 2014, he failed to gain traction. When Perry exited in the early round of primary season last fall, his super PACs still had $13 million to spend. 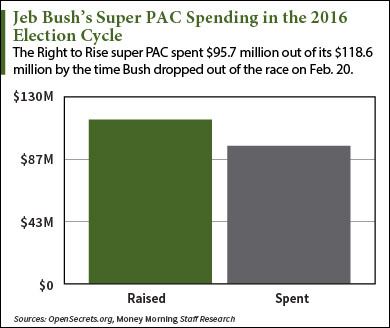 What will happen to Jeb Bush's "Right to Rise" super PAC's horde of cash? In Perry's case, the super PAC money all went back to the donors, reported NPR. Specifically, it was mostly returned to highball donors Dallas businessmen Darwin Deason and Kelcy Warren. Due to still-evolving campaign finance laws, there are actually very few rules for how super PACs must operate after their candidates stop running. In fact, super PACs can, if they wish, spend the remaining cash on staffers' salaries, stated CBS News on Sept. 30, 2015. Technically, this means the $23 million left in Jeb's coffers could go to Right to Rise's staff. But this likely won't happen because members of the political community would prefer to "keep up appearances." "You have serious political professionals who are closely associated with serious candidate's campaigns, and they have a real profession incentive to not abuse the good will of their donors," Paul Ryan of the Campaign Legal Center told CBS News. Super PACS can also simply continue to operate. This is what former GOP Congressman Newt Gingrich's super PAC "Winning our Future" did after he withdrew from the 2012 presidential election in May of that year. In fact, the committee continued to run for more than two years after he bowed out. The organization had raised $23.9 million dollars during Gingrich's run – most of which was donated by infamous Vegas mega-donor Sheldon Adelson, reported Politico in June 2012. The PAC eventually "refunded" a small portion of that amount – $5 million – back to Adelson's wife, according to FEC filings. "Winning Our Future" managed to stay up and running until July 2014. 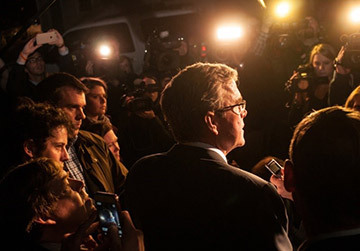 What do you think should happen to the remainder of Jeb Bush's super PAC money? Tell us on Twitter @moneymorning, or start a conversation with us on Facebook. CBS News: Zombie Super PACs: What Happens to All That Cash? NPR: What Happens to All That Super PAC Money When a Candidate Drops Out?